Apparently you can't buy beer on Good Friday. Some kind of law in Ireland bans alcohol sales today. Lots of people think it's a needless ban. I mean, come on... you can still buy a pack of smokes at the corner shop, but you can't buy a beer? I see. So the Irish lawmakers think it's fine to destroy your lungs, but not your liver on certain days of the year. I'm just bummed because I had a crappy day and I wanted to get a beer after work. 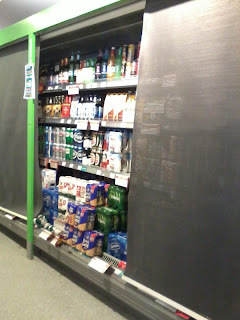 Then I come to the shop and find this; the beer aisle has curtains over it. Can't buy beer, but you still have to work? That's a bummer of an inconsistency! Well let me tell you... Dublin was running at about 1/10 capacity. I walked into work and asked the security girl, "Where is everyone else in the world?" Seriously, it was odd. Less than 1/4 of the parking spaces were used at my office. Normally people are fighting over spaces. I think the kids are all on Easter break from school, and many parents take the day off to make it a 4-day weekend. We get Monday off and call it a "bank holiday." So it's a big bank holiday weekend and lots of people travel around the country to see family, etc. That must have been so disappointing! Hope to talk to you tomorrow. We will be home all day. Hi Mamma! :) Yeah, well I made up for it by buying a bottle of Bushmills today. Ha! Take *that* organized religion!